Upper Bighorn Sheep Canyon is a mild whitewater rafting section of the Arkansas River characterized by long sections of mellow water interrupted by the occasional moderate-sized rapid. 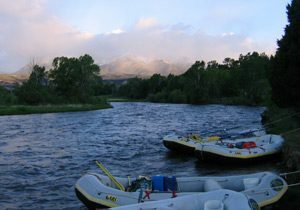 Upper Bighorn is perfect for float fishing adventures or for those looking for a family rafting excursion. It can also be combined with sections above and below it for a multi-day trip. Recommended For: Timid first-timers and families with young children. Get away from the day-to-day on this amazing, action-packed Arkansas River adventure. Enjoy fantastic whitewater during the day, including rafting Browns Canyon National Monument, and secluded camping at night. This trip departs from Buena Vista, Colorado – near Denver and Colorado Springs, and is suitable for all skill levels and kids ages 8+. Raft with us between May 15 and Aug 15. Raft with us on nearly every section we offer, including Browns Canyon National Monument, on the Arkansas River – all in one unforgettable 5 Day trip! With departures between May 15 and Aug 15, rafters of all skill levels and kids ages 8+ are welcome on this adventure. Meet and depart in Buena Vista, Colorado – near Denver and Colorado Springs. Notes: Upper Bighorn Sheep Canyon is a wonderful alternative to many sections on the Arkansas River if you have children that cannot raft due to age restrictions. Instructions: Parking alongside ramp or on city streets. Do not block the ramp when parking.